Nutrition is the foundation for great health. If your animal does not have the right nutrition, anything else you do will only be a temporary fix. We can’t express how crucial nutrition is. And getting the core diet right first, before you look at any supplements, is so important. There is never a one size fits all. How do you know exactly what your animal needs throughout their entire life? You muscle test. This is also called body wisdom. Muscle testing can be done with a partner and by yourself. It is wonderful if you can learn both techniques. Muscle testing is used to determine the right nutrition, including supplements and proper amounts, healing methods and topical products for both animals and people. Click here to learn more about muscle testing. You will learn how to muscle test using the deltoid and finger techniques. 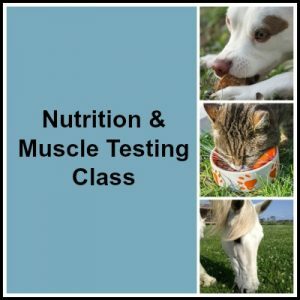 You can bring foods and products, images of foods and products or exact names of foods and products for muscle testing for your animal and even yourself. A small number of dogs may come. You can bring a photo of your animal. Muscle testing results are the same whether your animal is present or not. This is an intense, packed day where you will learn and perform muscle testing throughout the entire day.